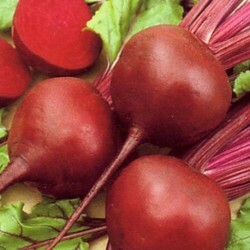 Beetroot is easy to grow in any home garden from seeds. The sweet underground-growing bulbs is packed with vitamins, minerals and antioxidants, plus the above-ground growing greens are tasty and packed with nutrition as well. 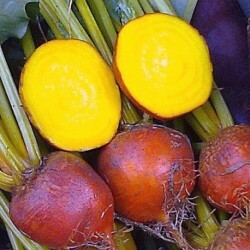 Planting beetroots provides a gardener with the unique ability to grow two vegetables in the same space. The lovely swollen bulbs are versatile in eating preparation and are simple to preserve for enjoying long after the garden season is over. 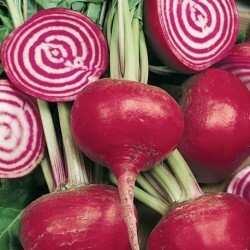 Beetroots come in red, white or yellow and all have green leafy tops. Each colour has a slightly different flavour and harvest time. 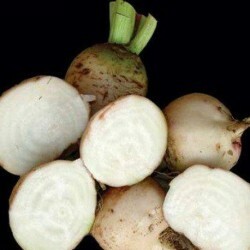 White and yellow beetroots reach maturity faster and won’t ‘bleed’ into salads or other dishes. 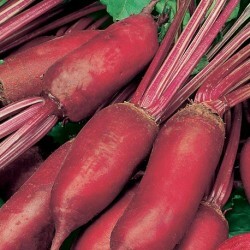 However, they don’t provide the desired red colour that most people associate with beets either. 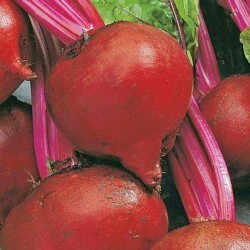 Beetroots are very easy to grow, and in our opinion plug plants should not even be available to buy. Sow the seeds from middle of April direct outside in your garden. You can plant the seeds in the UK till late June. The seeds can be sown in drills thinly, cover them with soil and water well. 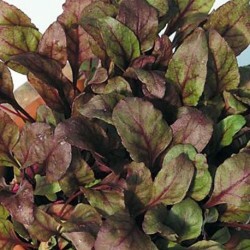 After germiation thin out the seedlings if they are too close to each other in the row, and keep the beetroots weed free and watered in hot weather, and make sure you eat the seedlings.